This chilled soup is ideal for a summer meal, and a sure way to impress any guest. 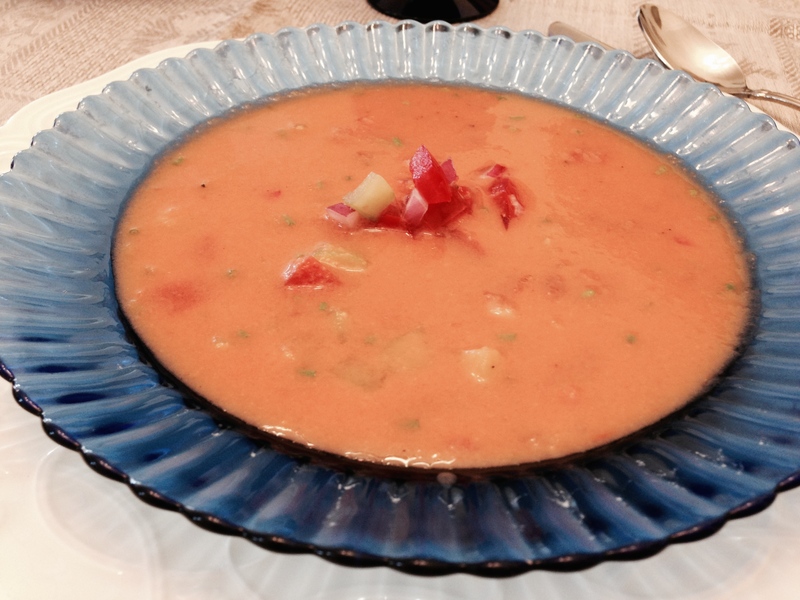 This is the gazpacho that blew my mind in Madrid when we first visited a few years ago — with a smooth, creamy, velvety consistency, but without any animal-based products at all. The recipe comes from Cook’s Illustrated. While the folks at America’s Test Kitchen often seem to needlessly complicate some standard recipes, this one is well worth the small additional effort to prepare the vegetables. Roughly chop 2 pounds of tomatoes, half of the cucumber, half the bell pepper, and half the onion. Toss in a large bowl with the garlic, chile pepper, and 1½ teaspoons salt. Set aside. Transfer the drained diced vegetables to a medium bowl and set aside. Add the bread to the exuded liquid (about ¼ cup), and soak for 1 minute. Add the soaked bread and any remaining liquid to the roughly chopped vegetables and toss thoroughly to combine. Transfer half the vegetable-bread mixture to a blender and purée for 30 seconds. With blender running, slowly drizzle in ¼ cup of olive oil and continue blending until completely smooth, about 2 minutes. Strain the soup through a fine-mesh strainer into a large bowl, using the back of a ladle or a rubber spatula to press the soup through the strainer. Repeat with the remaining vegetable-bread mixture and ¼ cup of olive oil. Stir vinegar, minced herbs, and half of diced vegetables into the soup and season with salt and pepper to taste. Cover and refrigerate overnight or for at least 2 hours to chill completely and develop flavors. Use remaining diced vegetables as garnish if desired. Serves 4-6. Prep time: 90 minutes; refrigerate overnight for ideal flavor. This entry was posted in Salads and Sides, Soups and Stews, Vegan and tagged Spanish by Baron. Bookmark the permalink.